We asked Great Lakes photographers to send us some of their favorite or toughest Great Lakes shots and a bit of a story behind the picture. This image and explanation are by David Marvin. Most people have never heard of the Crisp Point Lighthouse, much less ever visited it. It stands on the Lake Superior shore fourteen miles west of Whitefish Point, connected to the rest of the world by only a winding seasonal gravel road. Originally, Crisp Point housed only a lifesaving station, starting in 1876. In 1904, the lighthouse tower that still stands became operational. Over the decades, the Coast Guard disassembled all the buildings at Crisp Point until only the lighthouse tower and a small connecting building remained. Erosion caused by the powerful Lake Superior kept eating away at the higher ground on which the tower stands. In 1996, the building at the base of the tower succumbed to the erosion, leaving only the tower. A preservation group adopted the lighthouse and has raised funds to reinforce the shore along with reconstructing the entrance building next to the tower. 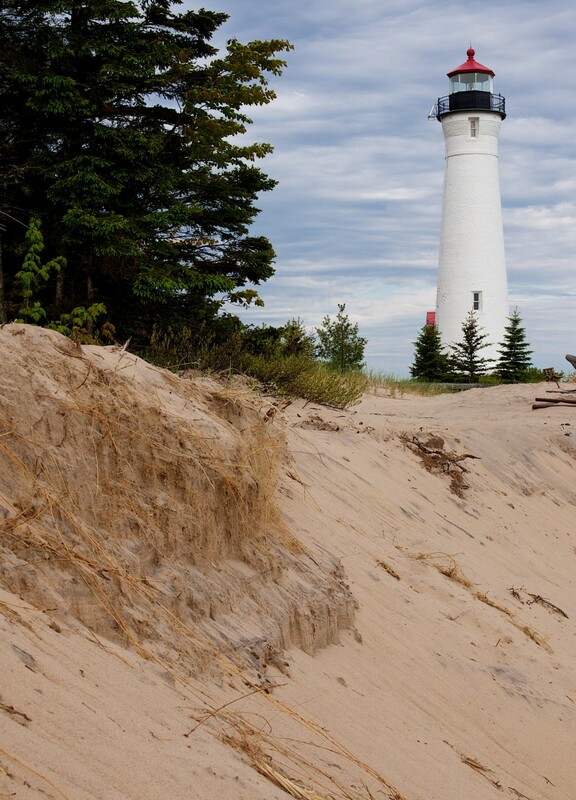 In this photograph, you can see the erosion of the beach with the Crisp Point Lighthouse in the background. The waves of Lake Superior still chip away at the shore, but with extra care, this historical treasure will live on for future generations. My husband & I found this great lighthouse in 2011…Driving down 123 saw a Lighthouse sign with an arrow. Followed til next sign & arrow. Again & again..until we found the lighthouse. No one there & not able to go inside. On next trip in 2014, drove 40 miles from campsite across gravel roads from west to east…found several people at site. Able to go into a shop, and take a tour inside & to top of tower. Most beautiful view! Thanks so much for the Historical preservation society..I will never forget this trip. My son and I visited last fall and thought the lighthouse was magnificent. The trip getting there was half the fun, 21 miles of dirt road with 42,000 pot holes. Glad we were in the pickup truck :} But well worth the trip. It did take about 45 min. to traverse that road of 21 miles.